Unless it’s Quentin Nelson. The kid is as good as I’ve seen. 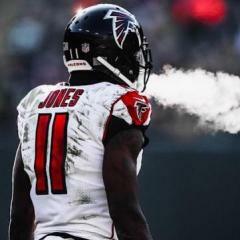 So good that we might have to do a Julio type trade to get up that high. That’s not going to happen, nor do I want it to. But the fact that a guard is that highly regarded says a lot. Tbh, I’m fine rolling with what we have a guard. It worked fine, and there’s only a couple guys I’ve seen so far that I think could set in and do better. I would be fine with Billy Price 1st rd. But rather go DT. I am not OK with what we have at OG. The interior OL has cost us too many games........including the Super Bowl. Mack is great, but he is all we have. Garland and Harlow might develop but Wes is what he is......and that ain't nearly good enough. Ryan, Freeman, Mack and Julio are in their primes. If we continue to mess around with the OL, we will waste all that talent. Josh Allen huh? That’s weird. If he falls, it’ll be the best for him to sit for a long time behind a very good QB. I don’t like him, but he’s got the tools. If he is given the keys to a franchise, I have very little doubt he will be a huge bust. But he could be something here. Now if we drafted Lamar Jackson, who we have seen at Louiseville, I’d be over the moon. I really like Fumagalli from Wisconsin. He’s a pretty good blocker and has great hands. He’d let us dump Toilolo’s contract and get a much better receiver. I love Josh Allen. Think he will be great. Any new reports? Anything to share? Don't understand the thought process at all. Why could Garland or Harlow still develop but not Wes ? Why is Wes maxed out after 1 year of starting experience ? Wes was complimented a lot during his rookie season. During training camp and throughout the year, there were reports of his rapid development. He had a lot of time to learn the blocking schemes and to work on his deficiencies. This may be his first year as a starter, but he had a lot of prep time last season. Bottom line: he has not progressed enough this season to trust that he will somehow be fine next year. Garland is older but was a DT. To me he is the jack of all trades sort of player and should remain in that role. Harlow is a true rookie and it remains to be seen what he has learned and how far he has progressed. I look forward to next training camp and hope that he competes very well. Truth be told, the window of opportunity is open now. Ryan, Freeman and Julio are at their peaks. There is not time to wait. We need better OG's now. Omg yessssssss. Riley is my boy! Just watched both CBs...... Will do a vid on them later. Liking Linden Stephens as a CB / FS. First Riley and now Quinton. The back-up search begins. It is time to cut the cost of a back up QB. Soon Schaub could move to QB coach.......if he wants to stay in the game. Hmmmm......I bet they were asking him if he would move to slot receiver. He looks really small but get this guy in the open field and he has break away speed!! I hope we talk to Nic Shimonek, the QB from Texas Tech. He's got a live arm and he's mobile. Didn't miss a beat stepping in for Mahomes this year. Me too!! Love his arm and he has pretty good mobility. I swear just last night I was looking at him and was putting him in my next mock. Atlanta Falcons - USC linebacker Uchenna Nwosu. I wonder is they asked him about Sam / Rushing? If we cut Brooks Reed would drafting Nwosu be a good move? Going to do a video on him since they talked to him.